2019 may be the year to transform your home or business. Last year’s designs were great, but you’re looking for a fresh way to reinvigorate your space and infuse some personalized touches that raise the bar for both luxury and comfort. Residents across British Columbia can find the right trends to capitalize on to create long-lasting value for their projects, and SaveMore Plumbing & Lighting is here to help every step of the way! Our high-quality plumbing and lighting stores in Vancouver and Surrey are here to deliver complete satisfaction for all elements of your building design. From residential to commercial lighting applications, we’re ready to provide expert advice and high-quality products to bring your vision to life. If you’re looking for new ideas to mix it up in 2019, read the second installment of our two-part series below to get started. Then be sure to visit one of our two lighting showrooms to get started! If you are having a hard time choosing between traditional and contemporary lighting designs, it may help to land somewhere in the middle. Transitional lighting has been spurred by an influx of home design shows that give DIYers the ability to transform their existing property into a dynamic space full of luxury and value. Transitional home designs can become masterpieces if designed properly, relying on traditional fixtures and designs in addition to modern elements to create a contrast that feels beautiful, not strained. Keep in mind that your pendant lighting will typically be the focal point for guests who congregate in your home or business. 2019 will see even more specialists and DIYers implementing transitional styles that are warm and welcoming. One trend that has gained steam over the last year is the introduction of large lighting fixtures to make a big statement for guests and capture the attention of the entire room. You can select one big fixture to dominate the center of any space, or go with two smaller options to create a nice balance that delivers a majority of the necessary lumens. If you decide that a large fixture will serve as your centerpiece in the room (i.e. dining rooms, over kitchen islands, foyers), be sure that it captures all of the elements of the room’s design. Small additions can help to lead the eye to this pendant or chandelier, wowing all who lay eyes on it. SaveMore is here to deliver the right products to make this trend a reality in 2019. While larger light fixtures can provide a focal point for any dynamic space, it can prove challenging to achieve the right balance. Be sure to incorporate smaller elements around the room to provide ambient lighting that supports your central fixture, not detract from it! While it is no secret that light emitting diodes (LEDs) have become more readily available than ever, many consumers do not realize how cost-effective these modern lighting solutions are. LEDs are more costly up front, especially when compared to their incandescent counterparts. 2019 will see more affordable LED options than ever, delivering a wide range of solutions that won’t break the bank. Many light fixtures now incorporate the safety, efficiency, and eco-friendly benefits of modern lighting elements to provide long-lasting benefits for consumers. One of the biggest advantages of LED lighting is that it can be personalized for every application. You can choose from dimmers, colour-changing options, and more. Keep in mind that certain light fixtures will rely on specific bulb types and sizes. In any case, SaveMore Plumbing & Lighting is here and ready to help! The new year may be your time to simplify your life while keeping everything neat and orderly. Many homeowners across Canada have recently sought out smooth, indirect lighting fixtures to produce a calm ambiance. Investing in these home lighting fixtures can help to create a soothing sanctuary for the family to rest and unwind. In commercial lighting applications, indirect lighting can also help to deliver subtle illumination that guides the eye toward key products or architectural designs. Behind design pieces — You have a piece of art you are proud to display or an appliance that captures the heart of your home design, so why not illuminate it? LED light strips can provide an affordable, effective way of creating welcoming glows behind nearly any existing fixture. Under your cabinets — LED lights can also prove beneficial in delivering a soft source of light beneath your kitchen cabinets. Not only will this option deliver the lighting needed to safely traverse this busy space, it can also help light the surfaces for a variety of tasks. Wall uplights — One versatile way to illuminate your space beautifully is to incorporate wall sconces and upward lamps to provide a soft glow. When deployed properly, uplighting can set the mood of a room without guests ever realizing where the source of light is coming from. SaveMore Plumbing & Lighting is proud to be your top-rated lighting store across Vancouver and Surrey, delivering luxurious outcomes backed by high-quality products and our team’s expert advice. We stock the best light fixtures across British Columbia, relying on intuitive design ideas and positive customer feedback to enforce the value of our services. 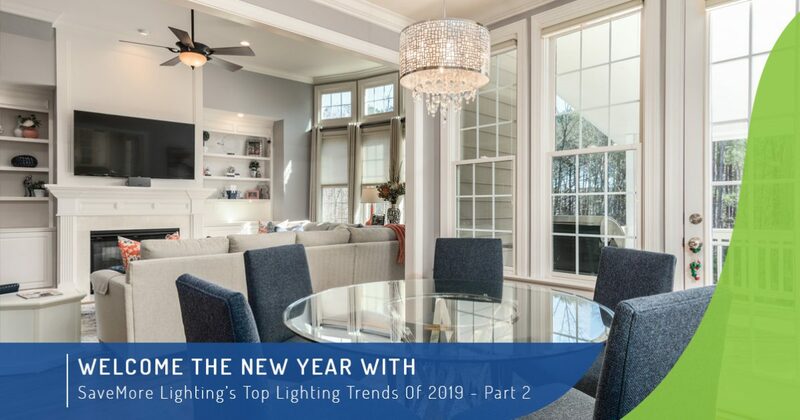 If you’re hoping to make a fresh change in your home or business in 2019, be sure to contact us today or stop by one of our expansive lighting showrooms to begin!